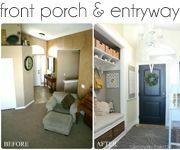 On our last home tour post, you saw the exterior and interior entryway of our home and how it made a huge transformation, so today, I thought we'd take you a little further inside and show you our hallway and main bathroom makeovers! Since our narrow hallway was a direct extension of our entryway, we wanted to make it feel like everything flowed well and appeared as large, bright and airy as possible. Like I've said a million times before, paint changes everything, so we started our makeover by giving our walls a good coat of Autumn Haze paint from Glidden. We also installed a simple, inexpensive track lighting fixture from Ikea, to better lighten the space and highlight the large, beadboard frames that we hung to feature each of our children's pictures in. Because the hallway is so narrow, we made sure to choose our decor wisely. Using larger, dramatic, reflective, streamline pieces to simplify, enlarge and add drama to the space, instead of cluttering it. Our main bath is also right at the end of the hallway, and since we have three little girls using it all the time, I wanted to make it pretty and dainty! Every girl needs a pretty bathroom to get ready in, right!? 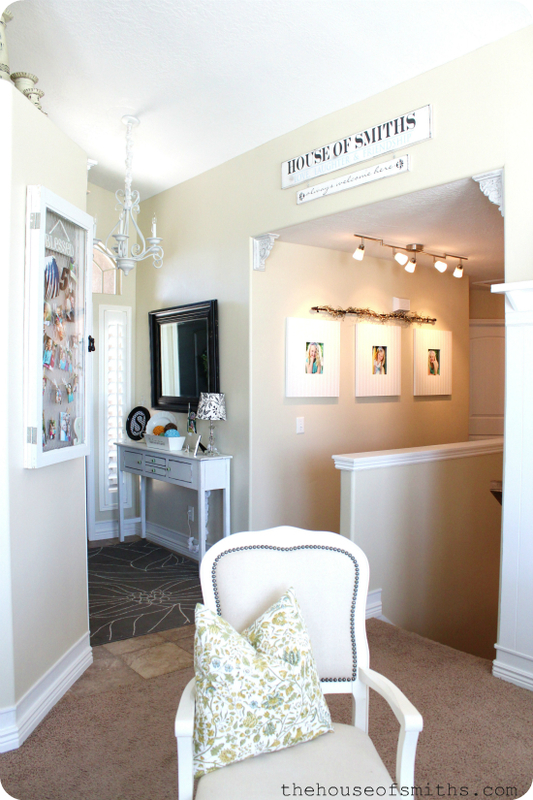 In this space we used Dockside Blue with a bit of white mixed in from Sherwin Williams to paint the walls, and added a custom frame to the existing wall mounted mirror, by using baseboard molding. One of our favorite DIY projects to date has been our beadboard ceiling! This little detail really gave the space a special touch, and was fairly easy to implement. 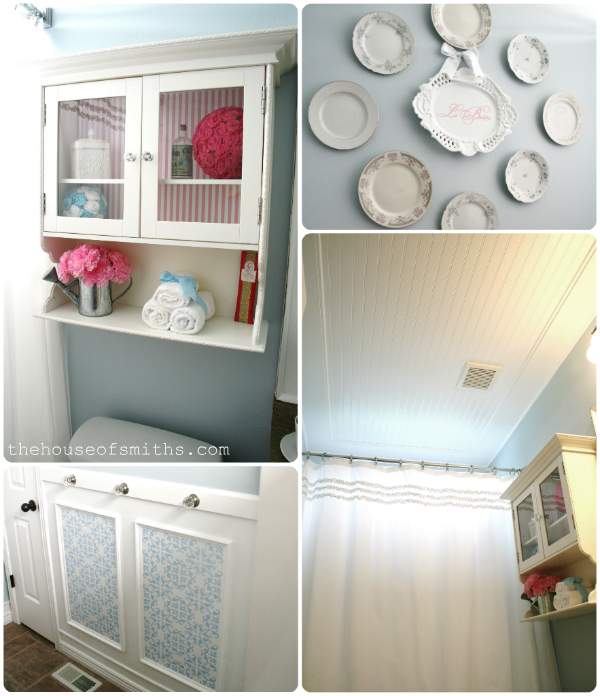 We also customized a cabinet from Target for the space over our toilet, added some thrifted antique plates, installed picture frame molding with decorative decals inside and a cabinet knob towel hanger bar. Making changes to these two small areas of our home have really made everything more inviting and added a lot of personality to our space. Again, for people who constantly email me saying... "I want to change my spaces style, but just don't know where to start!"... I say, pick ONE corner, shelf, room...even hallway, and just START. I promise, you'll be happy with the outcome, and the amazing results will keep you motivated to keep going. Turned out great! 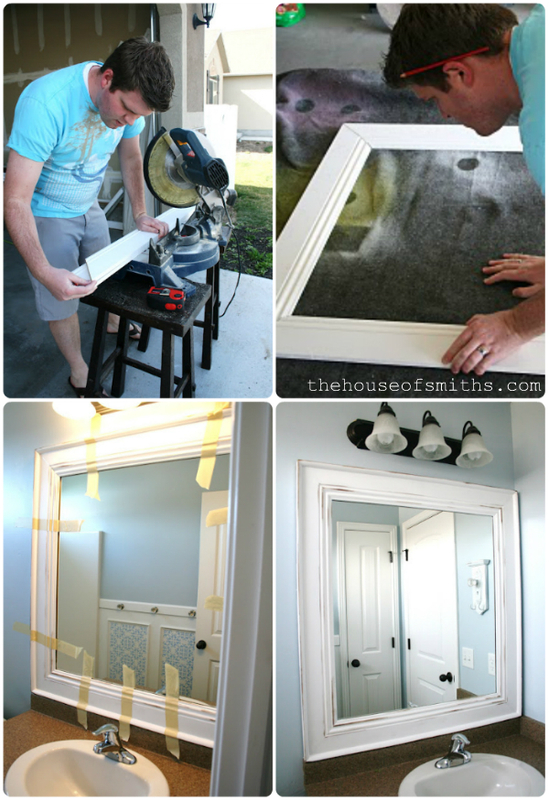 I love the framed mirror! I just love the main bathroom! So many pretty, yet useful things!! Love the improvements! 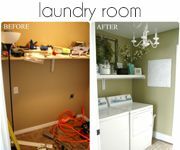 I am about to start making over our guest bathroom, and I'm very inspired by your bathroom! What did you use for the towel hooks? I want to get rid of our ugggly towel bar, and I think your hooks are cute! :) Thanks! 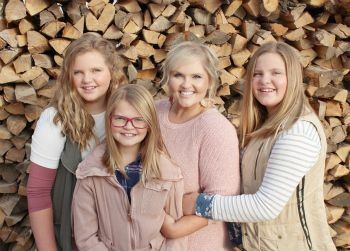 I love the large pictures with the lighting above and your family sign. As always, beautiful! 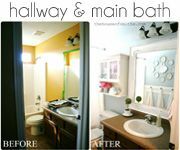 It truly is amazing how much you changed the look without replacing any of the main components (toilet, vanity, counter top or tub). It looks like a whole different room, much brighter than before as well. Love it. Thanks for the tips. 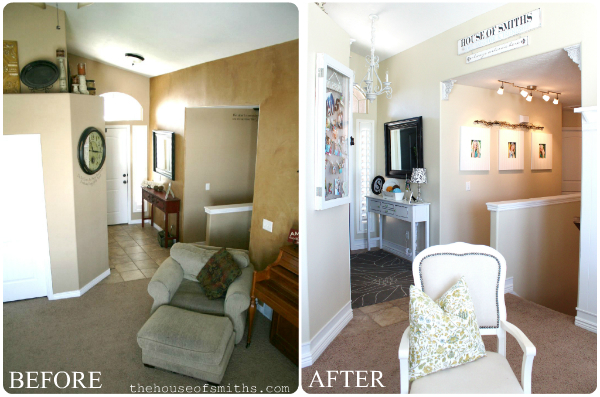 Isn't it amazing what a few coats of paint can do! 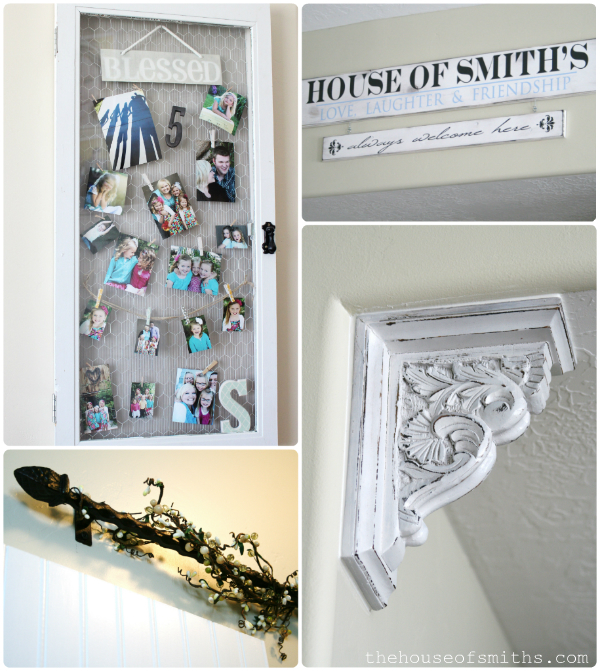 :) I love the beadboard frames in your hall!! The new paint colors are wonderful. We have been doing a bunch of stuff to our house, slowly, over the last few years. Inside and out. Painting, tile, sprinkler systems, teeny porch redo, laundry room redo, new sink & faucet in the kitchen, door hardware... if only to get rid of the standard oak woodwork. that bathroom has always been my favorite room in your house, because of the framed beadboard ceiling and those plates :) I get so giddy every time I see that you posted a new part of the home tour! Your house is serious eye candy, I love it all! How are the plates hung on the wall? I don't see any hangers... Thanks! I would like to know how the plates are hung as well, did you ever find out? ok - i have had to look at this a few times there is so much goodness going on and i still can't say anything other than i love it and will be looking at the changes at least 25 more times!!! LOVE IT ALL!!! Love your bathrooms. The ceiling is so nice compared to nasty cottage cheese which we have all thru our mobil home. Why do they do that? I love beadboard anywhere, especially on the ceiling. Yours looks so nice and clean. 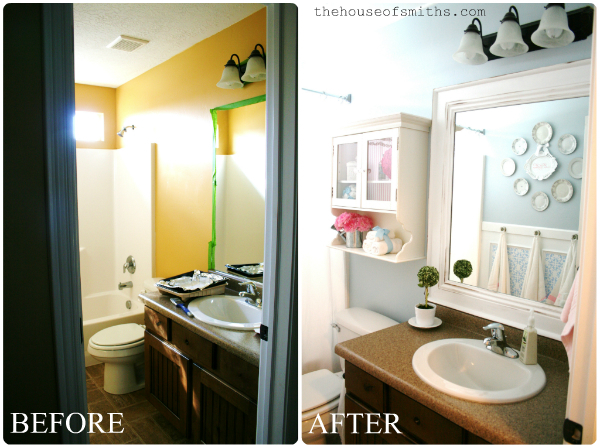 The things you did to spruce your bathrooms up made such an incredible difference. 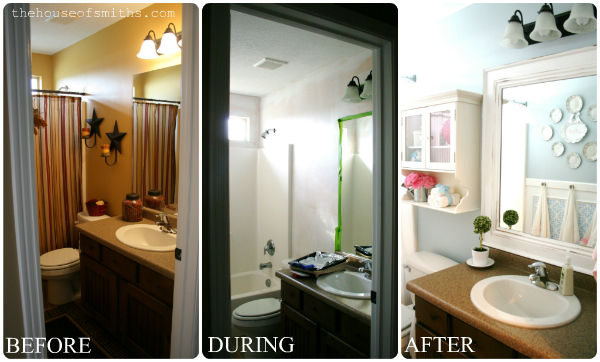 We also framed a big ugly mirror in our master bath and put new lights in over the mirror. Your hard work is an inspiration. So ugly and what a nasty messy job to remove it. If we could afford It I'd be happy with paneling on ceilings instead of that yuk. But who can afford to do the whole darn house with rooms running into each other. I'd paint the paneling and frame it on the ceiling. 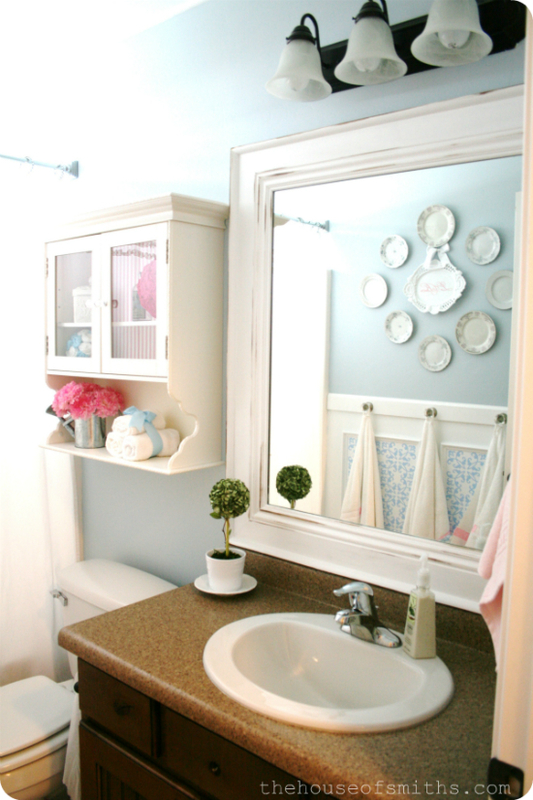 Their bathroom space is adorable! I love it! I agree sometimes you just have to start, the rest will come. However, knowing projects can often spin out of control and take forever (I have 3 young kids too) I hesitate to start, but so satisfied when I finish! Everything looks great! Everything is so fresh and up to date! Wonderful job, thanks for sharing with us! It love all the improvements you've made! It's amazing what paint and woodwork can do. i absolutely love your house. I love the beadboard ceiling and the decals in the wainscoting. I think i want to do beadboard on our bathroom ceiling or maybe in my girls room! thanks for the inspiration! 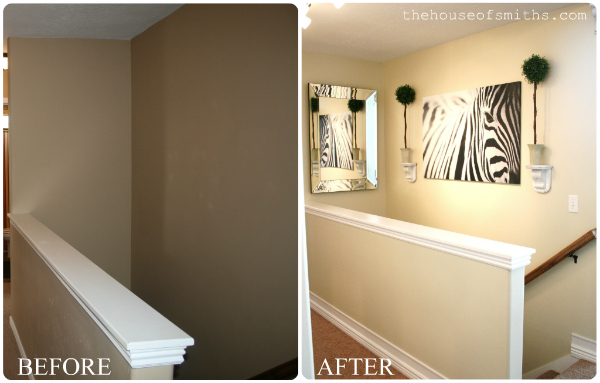 I LOVE the hallway transformation and especially the zebra print! 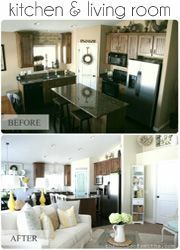 I wish I was as creative and talented as you because my home could use a make over! You did a great job! I love this bathroom! We are moving into a new home, and this room really inspired me in planning my two girls' bathroom! Thank you for sharing ~ I really love it! I would love to know how the plates are hung as well, so cute!! How did you hang the plates? Looks great. What a great eye you have! Looks Great! How did you hang your plates?